Recording the electric guitar means accurately capturing the sound of a guitar amplifier. The same concepts regarding on and off-axis frequency response still apply, however minimal changes can be much more audible as the sound pressure level is so much higher. While overloading a guitar amplifier to create distortion is a frequent and often desirable component of an electric guitar’s tone, overloading a microphone rarely achieves artistic results and instead leads to clipping—overload distortion of the recorded audio signal—and potential damage to your microphone and any other recording equipment in the signal chain. If it sounds as if the microphone or preamp are overloading, or input meters on your microphone preamp, mixer or recording software are blinking red, try engaging the pad switch on the microphone — typically providing a 10 to 15dB reduction in gain. Microphones are generally placed four to six inches in front of the guitar amplifier’s speaker for recording electric guitars. Proximity effect applies with guitar amps as well, so closer positions will yield more low-mid frequency sound. (See image “B”.) Repositioning the microphone from the center to the outer edge of the speaker can help to reduce this effect. 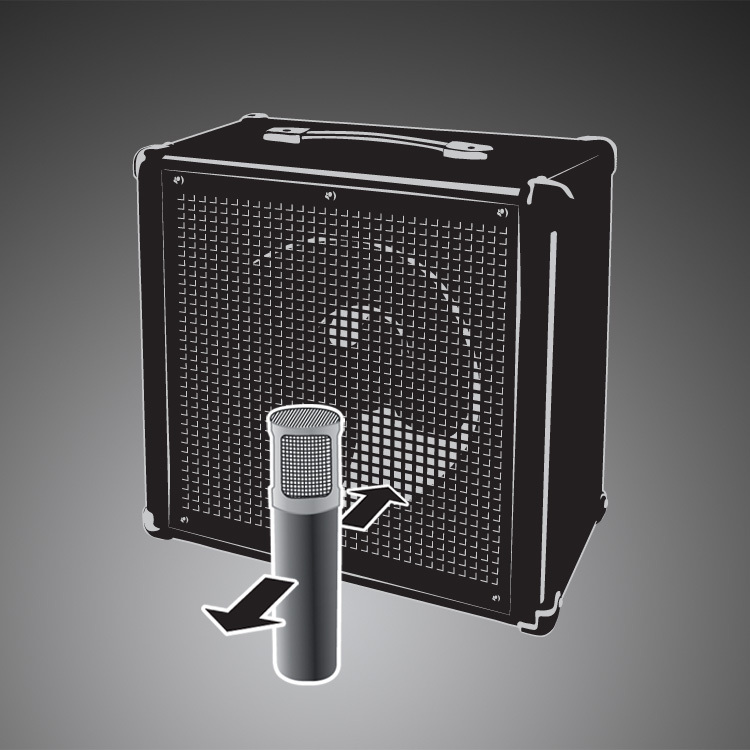 The center typically has a more “bassy” quality, typified by the direct, on-axis attack of the speaker movement. Positioning the microphone in front of the outer portion of the guitar amp speaker will typically result in a mellower sound. (See image “C”.) A popular technique is to monitor the signal in a set of headphones while moving the microphone until the “hiss” sounds minimal. By positioning the microphone in this manner, you will have more effectively reduced its sensitivity to the frequencies most likely to unflatteringly color or distort your recorded sound. As with most miking situations, moving the mic further away brings in more of the room sound. 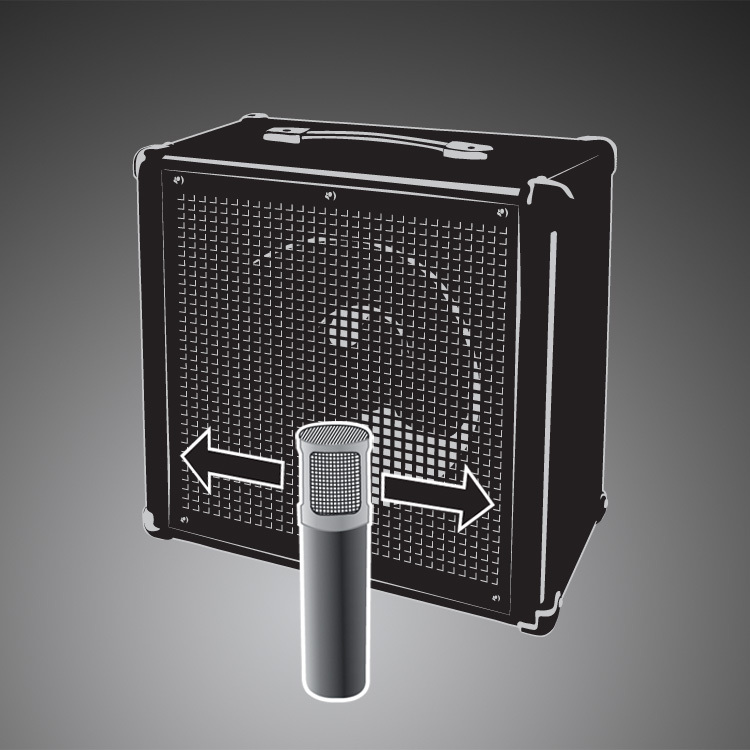 One popular technique is to use two microphones on the cabinet, each at different distances from the amplifier. For example, a dynamic microphone a few inches from the center of the speaker to capture attack and bite and a condenser microphone further back for a mellower sound allows for creativity during the mixing phase, like panning one track to the left and the other to the right for an interesting stereo effect, or both panned similarly to create the dual sense of a strong attack and plenty of depth. 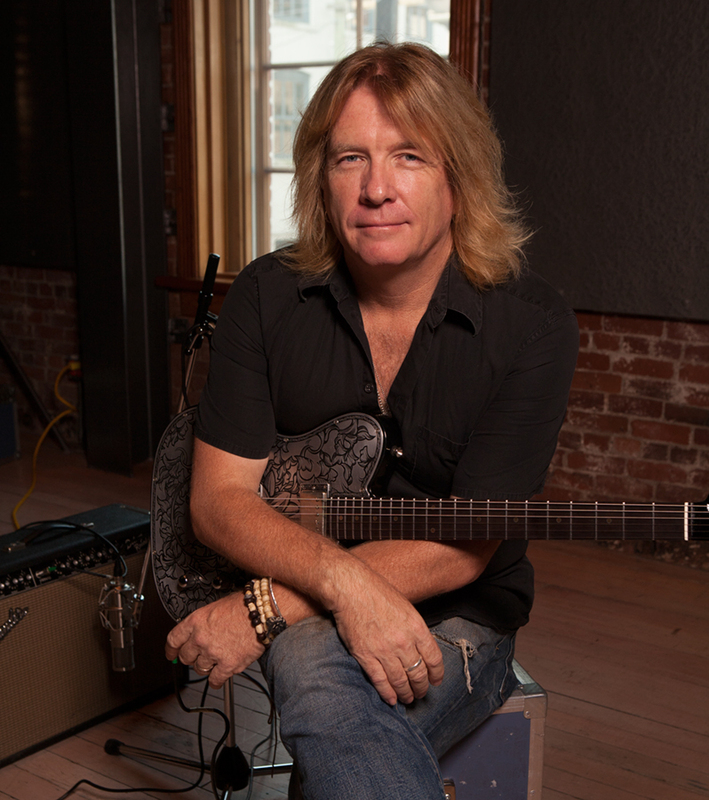 Starting his musical career as guitarist and co-founder of the rock band Payola$ (“Eyes of a Stranger”), Canadian-born Bob Rock soon moved into producing, working with a list legendary bands and performers such as Aerosmith, Metallica, Bon Jovi, David Lee Roth, Cher, The Offspring, 311 and many more. Bob can choose any microphone ever made; yet, time after time, he reaches for Sterling – for its quality and character. He uses them on anything and everything, from brass to piano, from voice to electric and acoustic guitar, all with consistently spectacular results. A popular technique is to monitor the signal in a set of headphones while moving the microphone until the “hiss” sounds minimal. By positioning the microphone in this manner, you will have more effectively reduced its sensitivity to the frequencies most likely to unflatteringly color or distort your recorded sound.